Review: 2014-05-17, the fight between Michael Chandler and Will Brooks gets three stars thanks to a good second part of the bout. Michael Chandler entered this fight with a professional mma record of 12-1-0 (83% finishing rate) and he is ranked as the No.7 lightweight in the world, last year he fought three times successfully defending the Bellator Lw title in his first two bouts, against Rick Hawn (=Chandler vs Hawn) and David Rickels (=Chandler vs Rickels), but then he lost the belt when he faced Eddie Alvarez in their second bout (via split decision Chandler vs Alvarez 2). On the original fight card Chandler was expected to face Alvarez for the third time but the champion was forced to withdraw. His opponent, Will Brooks, has a record of 13-1-0 (62% finishing rate) and he entered as the No.18 in the same weight class, he suffered his only defeat in 2013 when he faced Saad Awad for the first time (=Brooks vs Awad I), since then he has fought and won four times and he managed to defeat Awad in their rematch (=Brooks vs Awad 2); Brooks won the Bellator Lw tournament final against Alexander Sarnavskiy in his last bout(=Sarnavskiy vs Brooks). Currently the #1 in this division is Anthony Pettis. 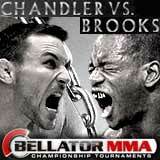 Chandler vs Brooks is valid for the interim Bellator lightweight title (they also faced each other a second time on November 15, 2014 Brooks vs Chandler 2); undercard of Quinton ‘Rampage’ Jackson vs ‘King Mo’ Lawal – Bellator 120. Watch the video and rate this fight!